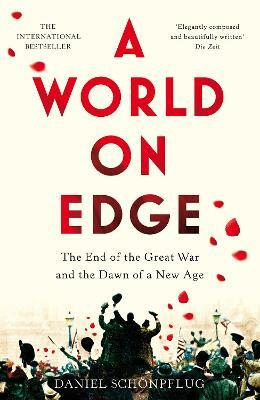 A World on Edge reveals Europe in 1918, left in ruins by World War I. With the end of hostilities, a radical new start seems not only possible, but essential, even unavoidable. Unorthodox ideas light up the age like the comets that have recently passed overhead: new politics, new societies, new art and culture, new thinking. The struggle to determine the future has begun. The sculptor Kathe Kollwitz, whose son died in the war, was translating sorrow and loss into art. Ho Chi Minh was working as a dishwasher in Paris and dreaming of liberating Vietnam, his homeland. Captain Harry S. Truman was running a men's haberdashery in Kansas City, hardly expecting that he was about to go bankrupt - and later become president of the United States. Professor Moina Michael was about to invent the 'remembrance poppy', a symbol of sacrifice that will stand for generations to come. Meanwhile Virginia Woolf had just published her first book and was questioning whether that sacrifice was worth it, while the artist George Grosz was so revolted by the violence on the streets of Berlin that he decides everything is meaningless. For rulers and revolutionaries, a world of power and privilege was dying - while for others, a dream of overthrowing democracy was being born. With novelistic virtuosity, historian Daniel Schoenpflug describes this watershed year as it was experienced on the ground - open ended, unfathomable, its outcome unclear. Told from the vantage points of people, famous and ordinary, good and evil, who lived through the turmoil and combining a multitude of acutely observed details, Schoenpflug composes a brilliantly conceived panorama of a world suspended between enthusiasm and disappointment, and of a moment in which the window of opportunity was suddenly open, only to quickly close shut once again. Dr Daniel Schoenpflug was born in 1969, and is a guest lecturer at the Free University, Berlin, and the academic coordinator at the Wissenschaftskolleg zu Berlin (WIKO). He specializes in European history from the eighteenth to the twentieth centuries, focusing on social and cultural history. Alongside his research, teaching and academic management work, he has also been successful in bringing history to a wider public and has co-authored scripts for docu-dramas broadcast on German national television, as well as writing A World on Edge.